The Moto G5 Plus is one of the few mid-range smartphones that will be updated to Android 8.0 Oreo, so if you're looking for such a device but don't want to break the bank, this is surely a great choice. Amazon is selling the Moto G5 Plus in two variations: Prime Exclusive and Standard Version. The former comes with a pre-installed selection of Amazon apps such as Amazon Widget, Prime Music, Prime Photos and many more. That's one of the reasons the Amazon Prime Exclusive is usually cheaper than the standard model. However, for a limited time, Amazon offers an even better deal on the Moto G5 Plus. If you don't mind owning the Amazon Prime Exclusive version, you can now buy one for just $210, so you'll be saving $90. 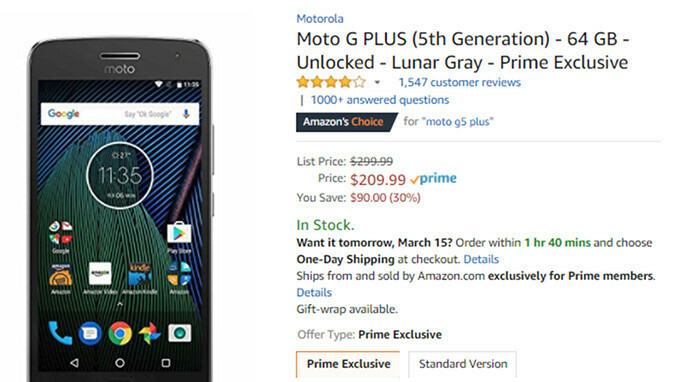 The unlocked 64GB Amazon Prime Exclusive Moto G5 Plus comes in two color versions – Lunar Gray and Fine Gold, but only the former is on sale. The same goes for the 32GB variant that costs just $175, although the smartphone usually sells for $230. Believe me, I would be the last person to say this -- but, after looking so many low-bezels phones recently, this one really looks outdated. I already felt that way since it launched, before all those new budget phones with small bezels came out, lol. The G5s plus doesn't give me the same feeling thou despite having bezels about the same size. The G5 plus has a 5.2" Full HD display. That is still not a bad screen by any measure. If Aashish.sapkota thinks the bezels are big on this smartphone, then you will think the iPhone 8's has a running to land planes on in comparison. Great phone. I don't care about bezels. Close to stock Android, decent camera, and excellent battery life is all I'm after. All the phones announced recently all look the exact same. First it's the bezels now it's the notch. There will always be something to complain about.